A typical single carriageway grid road, H4 Dansteed Way, looking east from Two Mile Ash. Note the tree lining, the redway cyclepath and the staggered junction for local roads. The Milton Keynes grid road system is a network of predominantly national speed limit, fully landscaped routes that form the top layer of the street hierarchy for both for private and public transport in Milton Keynes, (ceremonial) Buckinghamshire. The system is unique in the United Kingdom for its innovative use of street hierarchy principles: the grid roads run in between districts rather than through them. These facilitate higher speed limits due to the absence of buildings close to the roads, although more recently the initial concept has been eroded somewhat by making some of the grid roads 40mph. High-speed motor traffic is segregated from pedestrian and leisure cycling traffic, which uses the alternative Milton Keynes redway system. All grid junctions are roundabouts, which are efficient at moving cars but disadvantageous to buses and HGVs. The grid system is made up of 11 roads aligned roughly north-south and 10 aligned roughly east-west. In early planning documents, these were simply designated as "V roads" and "H roads" respectively (for "vertical" and "horizontal"); these designations have remained popular alongside the subsequent formal (conventional) names. V-roads are named as "Streets", and H-roads as "Ways". The roads are not precisely straight and aligned, and there are several places where two H roads, or two V roads, meet at a junction. The districts enclosed by the grid roads are known as grid squares. In addition, the A5 road between Old Stratford and Little Brickhill is a grade separated dual carriageway that is independent of the system (built to bypass the old Watling Street route), running between the grid roads but with four interchanges with the system. It is sometimes locally referred to as the A5(D), for 'diversion', to distinguish it from the 'old A5' which is now V4 Watling Street. The V8 at its intersection with the H9 Groveway looking north. Grid roads are characterised by high speed limits, generous landscaping and greenery along their routes, all pedestrian crossings being by means of under- or overpasses, roundabouts at every intersection and an almost total lack of road-fronting buildings. Many of these points can be seen in this  aerial image showing the V8/H3 junction. This section covers all of the major grid roads except the most significant ones which have their own articles. See V6 Grafton Street, H6 Childs Way, V8 Marlborough Street and H10 Bletcham Way. The H1 Ridgeway runs from the northern edge of Stony Stratford, across V4 Watling Street to a point on the V5 east of Wolverton. It is the shortest of all grid roads, having only two grid roundabouts and with a large gap where a bridge over the A5 should be. An aerial view is here . It serves Stony Stratford, Fullers Slade, Wolverton Mill and Greenleys. The H2 Millers Way is another short route. It begins at V4 Watling Street, crosses over the A5 and the West Coast Main Line, then joins the V6 Grafton Street at Bradville. Among others, its route serves the Milton Keynes Museum. The H3 Monks Way is the most northerly of the major H roads. Whilst being a dual carriageway for most of its length, it starts its route in the west of the town at a double roundabout with V4 Watling Street before running as a single carriageway up until a junction with the A5 and the V5 Great Monks Street at Abbey Hill. From this point, it becomes a dual carriageway and is co-designated as the A422. It continues east across the town, crosses over the M1, until it ends in a roundabout with the A509 road south of Newport Pagnell. The Concrete Cows are the best known landmark on this road. The H4 Dansteed Way is a longer route. It starts in the western district of Grange Farm, crosses the town through Linford Wood and ends formally at V11 Tongwell Street. However the route continues as Willen Road into Newport Pagnell. The H5 Portway begins its life in Oakhill as a single carriageway and remains as such up until its junction with the A5 (aerial view . From there it becomes a dual carriageway and becomes the A509. It runs along the top edge of Central Milton Keynes, over Willen Lake and terminates at Northfield Roundabout with H6 Childs Way near M1 Junction 14. The route continues on as the A5130 road. The H6 Childs Way runs from Whitney in the west of Milton Keynes to a point short of Junction 14 of the M1 in the east. For a more in depth description see the road's own article. The H7 Chaffron Way is one of the longest grid roads but is a single carriageway for the entirety of its route. It starts in the district of Tattenhoe Park where it had a 300-metre extension built in 2007, runs past Westcroft District Centre, Furzton Lake, The National Bowl, bridges the A5 and the West Coast Main Line in one go, passes Woughton before terminating at a roundabout next to Broughton. In March 2010, Countess Way was opened which links to Newport Road (A5130), a dual carriageway with a permanent bus lane on each side with traffic lights at either end. H8 Standing Way is a dual carriageway that crosses the entire town from west to east, co-designated as the A421. The route begins at M1 Junction 13 and enters Milton Keynes near Wavendon. 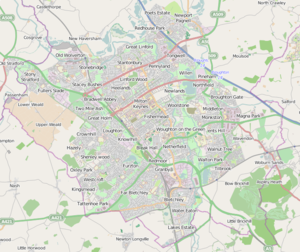 Its route takes by the Open University, Milton Keynes University Hospital, over the A5 and the West Coast Main Line, a finally leaves the town at Tattenhoe. The H9 Groveway is partly dual-carriageway, running from the major roundabout junction with the A5 and V6 Grafton Street and terminating between Brinklow and Wavendon Gate, at a roundabout junction with Newport Road, the A421 and the H8 Standing Way. The H10 Bletcham Way has its own article. V1 Snellshall Street begins at Whitney and ends at Tattenhoe in the south west of Milton Keynes. V2 Tattenhoe Street begins at Hazeley in the west of Milton Keynes and travels south to end at Windmill Hill in Far Bletchley in the south west of Milton Keynes. Its route takes it past Woodhill. the Grand Union Canal passes over V6 Grafton Street between Bradville and New Bradwell on the modern Bradwell Aqueduct, built specifically to accommodate it. The V3 Fulmer Street Starts at is northern end between the districts of Crownhill and Grange Farm at a three (soon to be four) arm roundabout with the H4. It runs south crossing the H5, H6 and H7 before terminating at the H8, continuing on in the form of Shenley Road into West Bletchley. The V4 Watling Street is part of the longer Watling Street. The V5 Great Monks Street runs from Wolverton Mill to Great Holm and Two Mile Ash. It is single carriageway for its entire length. The V6 Grafton Street is a major local road in Milton Keynes key to the layout and urban form of the 'new city'. It starts beside Wolverton railway station in the north of Milton Keynes, between Wolverton and New Bradwell and extends as far as Denbigh (where it provides access to the Stadium:mk), where it terminates in a three-direction roundabout with the H10 Bletcham Way and V4 Watling Street. For a more detailed description see the road's own article V6 Grafton Street. The V7 Saxon Street starts off near New Bradwell in the north of the town as a single carriageway and remains as such past Stantonbury to its junction with the H4 where it becomes a dual carriageway. In this form it runs straight through the heart of Central Milton Keynes between the Centre:MK and the Church of Christ the Cornerstone and then returns to being a single carriageway after its junction with the H7. It then has a 40 mph (64 km/h) speed restriction on it for two grid squares until the H9. After passing the new Stadium:mk and crossing the H10 it becomes a dual carriageway once more and terminates in central Bletchley. The V8 Marlborough Street runs from Stantonbury to Mount Farm. For a more detailed description see its own article. The V9 Overstreet is the shortest of all the 'V' roads, it runs from H3 Monks Way to H5 Portway. It is single carriageway the entire distance. It serves Downs Barn, Downhead Park, Neath Hill and Pennyland. It is notable for Neath Hill Local Centre designed by Wayland Tunley as being one of the few local centres in Milton Keynes built to straddle the grid roads rather than being embedded within the interior of the grid square. Overgate continues from H5 Portway through Campbell Park to H6 Childs Way though this is not signed V9. The V10 Brickhill Street is mainly a single carriageway, but it is important in being one of the few that run continuously between the northern and the southern borders of the town. It is only a dual carriageway for 200 metres south of the H4 roundabout at Willen. Finally the V11 Tongwell Street is a single carriageway to its junction with the H6 where it picks up the A4146 road. It is then a dual carriageway as far as the H10, then finally a single carriageway again for a very short distance into the districts of Old Farm Park and Browns Wood. There are other roads in Milton Keynes that could superficially be considered part of the grid system. Wolverton Road, formerly the A422, runs right from Stony Stratford to Newport Pagnell and functions as a grid road for much of its route (although with traffic calming measures). Indeed, the 1970 masterplan for Milton Keynes proposes that the stretch from New Bradwell to the M1 motorway bridge (near Newport Pagnell services) would be part of the H2. The A5130 road skirts the eastern edge of Milton Keynes forming an important route to Junction 14 of the M1 and is a de facto V12. Part of this route has been downgraded into a densely built, slow-speed, mixed mode "City Street", despite some local opposition Upgrading this road to a grid road was considered at a meeting of the Milton Keynes Partnership, and immediately being dismissed without explanation, despite local parish councils voting 22 in favour and one abstaining to oppose the A5130 downgrading plans as they go against the nature of the grid system. The 2004 expansion of Milton Keynes did not follow the grid principle, although several new extensions were planned to the grid network. Following later changes in policy new grid roads are once again being planned. They are listed below in numerical order, listing H-roads first. H1 Ridgeway link-up: The land for this has been reserved since the 1970 Plan for Milton Keynes. This would join the two halves of the H1, crossing the A5. There have been alternative proposals to build on the H1 reservation (between Galley Hill and Fullers Slade) which would prevent the road link up, but current local policy prohibits building on grid road reserves. H6 Childs Way extension to Kingsmead: This was completed in 2004 and terminates here. It was the last section of grid road completed before the 2004 plan came into force. H7 Chaffron Way western: A downgraded H7 is planned to extend further between Kingsmead and Tattenhoe Park, according to the Kingsmead South master plan. This is named 'Hayton Way' and is a 30 mph 'City Street'. H7 Chaffron Way eastern: the H7, as a 30 mph 'city street', has been extended through Broughton Gate (Eastern Expansion Area) to the A5130 (Newport Road). This opened in March 2010 as 'Countess Way', although a new public square on the road has since been named 'Chaffron Square'. H8 Standing Way eastern: The A421 towards Junction 13 of the M1 is being dualled in stages, with landscaped reserves, redways, underpasses and roundabouts. H10 Bletcham Way eastern: A short extension will take the H10 into the new district of Church Farm, east of Old Farm Park. V2 Tattenhoe Steeet north: The V2 will extend north to the top of Grange Farm and meet the H4 before becoming a 'city street' and running north into Fairfield (Western Expansion Area). V7 Saxon Street north: In the form of a 'city street', the V7 will penetrate the new district of Statonbury Park Farm and loop round back on to the old Newport Pagnell – Wolverton Road, according to the master plan for the development. V8 Marlborough Street south: The V8 is planned to run alongside the A5 to join H10 Bletcham Way at Fenny Lock. V10 Brickhill Street north: The V10 is being extended north to meet Little Linford Lane, providing an alternative route from Newport Pagnell at the Poets Estate. However this stretch is not designated 'V10' and will have a 30 mph (48 km/h) speed limit. V12 Fen Street: The 'city street' of Fen Street runs through the Eastern Expansion Area, although more recent planning documents have treated the southern section through Magna Park as a grid road. This road is planned to run south as a fully-fledged grid road through a housing development on the site of Wavendon 9-hole Golf Course. The western and eastern expansion areas being developed by Milton Keynes Partnership moved away from the grid system towards a more traditional road layout centred around 'city streets'. The Milton Keynes Forum and the Urban Eden pressure group are both fighting this, in favour of extending the grid system. The 'city streets' are designed to function as high streets, providing focal centres for the new developments and providing public transport corridors. Following policy changes in 2011 grid roads have been reintroduced into the WEA. ^ As detailed below and in the redway system article, experienced and commuting cyclists may choose the grid roads over the redways. This page was last modified on 7 May 2016, at 20:32.